If Google Penalized Law Firm Irwin Mitchell, Why Does The Redirect Rank Well? Home > Google News > Google SEO > Why Does Irwin Mitchell's Redirect Rank, If Google Penalized Them? 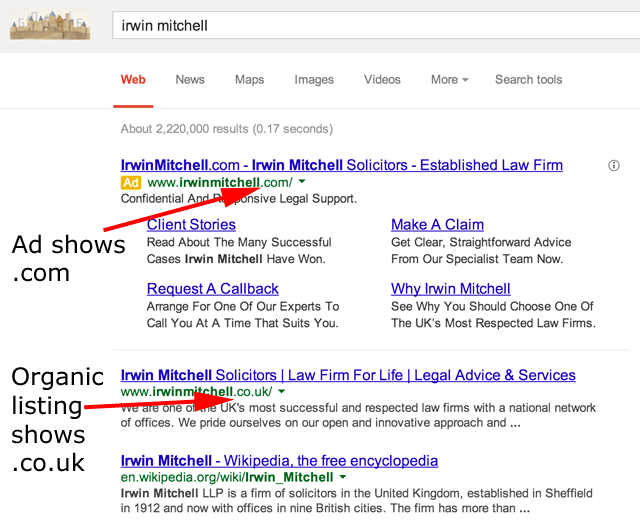 (2) Irwin Mitchell's web site no longer ranking in Google for it's own name. What is interesting is that the .co.uk version of their domain name ranks #1 but the .com does not. The .co.uk version actually 301 redirects to .com, so why wouldn't the penalty flow through to the .co.uk version as well? David Naylor's blog goes into detail on this Irwin Mitchell penalty, showing why they were penalized. But shouldn't Google also penalized the .co.uk? I know the .com, which has the penalty, doesn't redirect to the .co.uk version. But it does go the other way and it is a 301 redirect. So Google knows the .co.uk version should be the .com version. This just seems weird to me.